Caraga is an administrative region of the Philippines, located in North -Eastern island of Mindanao (compare map). Established as Region XIII in 1996, it is one of the newest regions in the country. The region is composed of four provinces: Agusan del Norte, Agusan del Sur, Surigao del Norte and Surigao del Sur; three cities: Butuan, Surigao and Bislig; seventy municipalities and 1,346 villages. Butuan City is the regional centre. It has a total land area of 1,902,980 hectares or 18,847.2 sq. km. representing about 18 percent of the total land area of Mindanao and roughly 6 percent of the Philippines. The total population of Caraga in 2000 was 2,095,367 with average growth rate of 1.63 percent per year. Approximately 10.5 percent of the population are indigenous people. 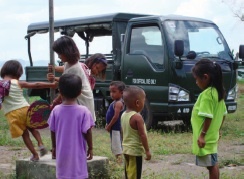 An ethnically diverse society with long history of social discrimination of indigenous communities and deprivation of economic access, Caraga has a predominantly settler population a significant number of whom have inter-married with indigenous people. The region is rich in natural resources and is noted for its wood based economy, its extensive water resources and its rich mineral deposits, good agricultural base and excellent tourism potentials. However, despite its natural resource endowment with a highly varied ecosystem, Caraga is the second poorest region in the country with a 2006 income poverty incidence of 53 percent of the population. The region is still subject to the effects of an armed struggle by the New Peoples Army (NPA) despite the efforts undertaken by the Armed Forces of the Philippines (AFP) to dismantle it. The NPA was formed in 1969 as the guerrilla wing of the Communist Party of the Philippines. A multi-dimensional set of violent conflicts and conflict dynamics best describes the complexity of the current conflict situation in Mindanao. Contrary to popular belief, there is not just a single “conflict” in Mindanao but there are many. The “conflict” most often referred to in Mindanao is the armed struggle of the Bangsamoro for right to self-determination against the Government of the Republic of the Philippines (GRP). Some of the other conflicts on-going in Mindanao are equally important. These include the long-running communist insurgency, lengthy and often-violent clan conflicts (locally referred to as “ridos”), terrorist acts, domestic violence and organized criminality. There is also plenty of potential for new conflicts in the future, most notably, among the Bangsamoro population, between Christians and Bangsamoro, between settlers and Indigenous People (IPs). Political rivalry between different levels of local government structures, and the control of economic as well as political power through dynastic clans are important stumbling blocks. Natural resource conflicts (e.g. land entitlements, access, use, and exploitation of natural resources) also stem from overlapping mandates of the different line agencies dealing with natural resources and assets and the unclear role assigned to the local government units which have a direct relation to the location of the natural resources and assets and the communities. The different conflicts and the violent form in which they appear are partly overlapping, interrelated and based upon the same root causes such as social and economic injustice, poor governance, corruption, feudalism, nepotism and incompatible laws. However, the ideological reasons for the struggle vary. The struggle for self-determination is important for parts of the Muslim population, but seems to have no priority for the communist movement and IPs. They struggle more for a general substantial nationwide political reform. Provide important entry points for subsequent peace building actions. The conflict assessment was undertaken over a three-month period of time, it was guided by 9 professionals (national and international consultants). 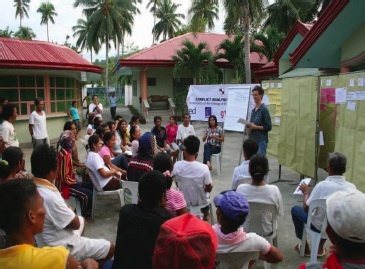 The in-depth assessment was undertaken in selected areas of Caraga region. The areas were selected on the basis of geographic characteristics and the associated conflicts (e.g. typologies). The typologies selected were coastal areas, lowland areas, and upland areas. 480 persons (stakeholders) participated in the conflict assessment, in total 36 persons (so called reference group members) were selected and trained and they conducted 207 key informant interviews and 33 focus group discussions involving 237 persons. The total cost of the assessment was approximately € 150.000. The assessment was planned and implemented jointly by the Philippine partner organisations led by National Economic Development Authority – NEDA Caraga Region and the German Development Organizations, principally the GTZ/ CIM, DED/ZfD, KfW, and Forum ZFD. Although the following process is described sequentially, in reality the processes were often undertaken in parallel and / or iteratively. At the outset a short concept paper was elaborated to define the goals and conceptual approach of the conflict assessment. The concept paper was prepared in a participatory manner amongst the partner organisations. From a process point of view the elaboration and agreement on a guiding concept was an important milestone. It served as part of the confidence building process between the different organisations and formed the basis for the operational design of the conflict assessment. The concept paper provided the theoretical basis for the conflict assessment, it set out how the assessment should be conducted and it described the organisational and contextual framework for the study. Furthermore, the concept paper defined criteria for managing the conflict assessment (including criteria for stopping interventions in the event of a conflict), suggested various methods and tools to be applied and included proposals for time plan, management and communication of the whole process. In a nutshell, the concept paper provided the guiding framework for the entire Assessment (for a conceptual background compare Participatory Community Peace and Conflict Assessment on www.methodfinder.net). Conflict issues and recommendations contained in conflict analyses undertaken by other international development organisations (e.g. UNDP). Conflict lines or typologies: An overview of the number and types of conflicts that existed in the region was provided. Similar conflict lines were then clustered into different categories (or typologies). Many of the conflicts could be associated with the geographic locations. For example, many of the resource-based conflicts are common in the upland areas where the mineral deposits can be found; it is also where the majority of the indigenous people live. Important in this selection process was the need to ensure that the samples selected would be representative for the majority of conflicts in the region. The conflict typologies provided the basis for determining the breadth of the conflict assessment (i.e. how many conflict lines should be addressed). Methodology and depth of data collection: The second part of the assessment involved determining how many people should participate in the conflict assessment. To answer this, its was necessary to determine the form and methodology of how the stakeholders would be involved in the Participatory Community Peace and Conflict Assessment. Three key methods were elaborated: key informant interviews, focus group discussions and then integration workshops. Approach for ensuring stakeholder participation: Getting the stakeholders to participate in the conflict assessment was at the centre of the whole approach. This meant that the stakeholders should themselves conduct the assessment. They were to undertake the key informant interviews and focus group discussions. The proposal made was to organise the stakeholders into groups, termed “Reference Groups – RG”. For each of the three typologies (e.g. upland, lowland and coastal areas) two samples areas were selected and two reference groups were formed for each area. 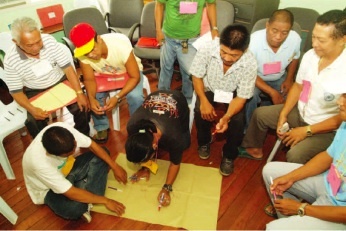 Structure for gaining decision-makers acceptance: If the results of the conflict assessment were to be representative for the Caraga region, then it would be essential to have the necessary political backing and acceptance by key decision-makers from government, civil society, security forces, etc. The proposal in the concept was to establish a Consultative Group – CG comprising the key stakeholders. Proposals were made as to who should be nominated and participate as CG members. The objective being that the Consultative Group would advise and support the conflict assessment process. The professionals from the project tasked with technically guiding and leading the whole process were organised into so-called Technical Working Group – TWG. It was composed of 9 professionals (international and national project staff and consultants). 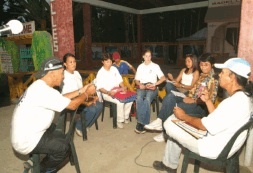 Essential is that the TWG members must be competent in being able to implement and supervise a participatory conflict. Ideally they should have profound technical and practical knowledge of conflict transformation and peace building as well as having a deep understanding of community mobilisation, facilitation and empowerment processes. Three-tier structure: Thus, the three-tier organisational structure outlined in the concept paper was completed with the naming of the organisations and persons to be involved. The final structure was composed of six Reference Groups (two per typology), one Consultative Group and one Technical Working Group (compare figure 2). Personnel planning - formation of the Technical Working Group: A key success factor of the conflict assessment was the ability to harness a wide range of Philippine and German expertise as part of the core Technical Working Group. A total of nine consultant experts were divided into three teams (one team for each typology coastal, lowland and upland). The combination of expertise within the Technical Working Group was a key to the success of the conflict assessment not least because of the plurality of experience and perspectives that was available within each team. The national project experts brought with them specific local area know how and experience of working in a conflict environment in other parts of Mindanao as well as being able to speak the local vernacular. The national experts and consultants brought with them an independent view and specific sectoral conflict expertise (e.g. land conflicts or conflicts involving Indigenous People). The international peace building and conflict transformation experts from the German Development Service-Civil Peace Service (DED-ZFD) and Forum ZFD brought with them the specific training in peace building and conflict transformation know-how needed for the conceptual design and development of methodologies. Internal team communication: The team communication within the TWG was organised in several steps: Initial briefing workshops / kick-off workshops which served to provide all team members with the necessary information and documents on the region and on existing conflicts. The regular weekly meetings on two levels – by typology and inter TWG provided the space for reflection, levelling off, coaching, and for having more checking safeguards against any flaws in the plan. The dialogue stimulated more ideas for the team to achieve common understanding and agreement of options for the undertaking. Conscious effort of TWG in writing the minutes of meetings to provide access to updates and feedback was important to share relevant information with all TWG members. Overall management: Apart from the overall steering and management function, which was undertaken by the German project manager, the role of the secretariat was also important. The secretariat was responsible for managing all logistical arrangements such as hotel bookings, organising workshops and seminars, drafting letters of invitation and official letters of request for meetings, ensuring that vehicles for transport are available and also ensuring the proper administration and accounting of the funds required for the conflict assessment. One important task was to organise the necessary security clearance for travelling into conflict-affected areas. For coordination of the day-to-day activities, travel and meeting schedules a large plan of operations was drawn up on pin boards. This was updated on a daily basis to ensure that all logistical and personnel planning was properly coordinated. In addition, email contact, regular mobile phone contact and travel monitoring was undertaken for security and risk management purposes. Whenever the team felt it was necessary the conceptual approach was modified and adapted according to the situation, the reason being that in any conflict setting a flexible approach is necessary. Compensation package for reference group members: It was agreed that the RG members (e.g. stakeholders) who would do the majority of the work as far as data gathering and assessment is concerned needed some form of compensation for their work. Therefore, the minimum basic wage for a rural labourer was set as the amount to be compensated for their efforts. In addition, they also received allowance for travel and accommodation costs if these were incurred. All RG members had agreed to work on the conflict assessment prior to any discussion on a compensation package. This was important to ensure their willingness to participate voluntarily. Although the main areas where the conflict assessment was to be undertaken was proposed in the context analysis (compare process 2) a final decision needed to be taken by the Consultative Group in close consultation with the Technical Working Group. The TWG members travelled extensively in the three typologies (e.g. uplands, lowlands and coastal areas). These reconnaissance trips were designed to gain an in-depth understanding of the areas and to take up contact with the key conflict stakeholders. The objective of the field visits was to determine the exact geographic focus areas as well as well as to identify potential stakeholders who would participate in the conflict assessment. Fourth, to serve as sounding board on the results of the assessment. The CG was also the central body for giving recommendations on the results of the assessment presented at the end of the process by members of the Reference Group. This was key for communicating the results of the assessment to political decision makers and thus connecting the different levels of political decision-making. Representatives of the Philippine political partner organisations and German Development Organisation (GTZ) as well as representatives from the donor community in Caraga, namely 2 persons from the Mindanao International Non-Governmental Organisations (MINGO) Forum. Present own views and represent a cross-section of viewpoints and concerns on existing and potential issues affecting the communities/interest groups with regard to the identified conflict lines. The RGs played the role as conduits for people to express their views and opinions over issues on access and control of resources and other pressing problems in their communities. With the mentoring and accompaniment of the TWG in the field the RGs acquired new skills in gathering primary data and analysis of the issues through the available data. They also learned to manage these in ways that would not create more tensions in the communities. The final selection of the RG members was a complicated process. During the field visits the TWG had interacted with all key stakeholders in the area and jointly elaborated a list of potential RG members. The TWG members assessed the persons during interviews and a peer-review process. The peer review process was substantiated by additional information generated during the interviews. The key information consisted of biographical data and educational background, status in the community, experience in working with NGOs, local governments, donor programs, etc. Not an ideological and religious zealot (to avoid debates over dogmatic and preconceived notions at the onset). Given the heterogeneity and variances in personal and social development settings, attitudes and behaviour, it was important to minimize chances of spoilage and conflicts within the RGs. Addressing this proved to be a challenge during the selection process as it was not always possible to find potential members of the RG willing and able to participate. Need to serve as platform for capacity building in strategic communications and to sustain communication systems and practices. Effective internal communication (focused on the political partners and implementation partners as primary audiences) is used as instrument for effective management. Sound external/public communication is used as instrument for building relationships and promoting coalition building and social and political mobilization for change. After the successful training, the RGs developed individual and group action plans, which identified key informants, community preparation activities and schedules for the Key Informant Interviews (KIIs) and Focus Group Discussions (FGDs). The RG members then started the actual process of data collection. The task of the TWG was to coordinate the process and as well as to provide technical backstopping. The process of data gathering, analysis, assessment, and integration into an overall conflict assessment report is depicted in figure 4 (data collection and analysis 1a and 1b). The results of the focus group discussions and key informant interviews produced a large amount of information, which had to be analysed and assessed. The Reference Group members undertook the initial data and information analysis with the guidance of the TWG. The data analysis process was further complicated by the fact that the information was often in the local language and had to be translated to English for analysis purposes. The different levels of education of the RG members also meant that the data analysis took longer than had been initially planned. The data analysis process required the skills and competencies of the TWG in order to ensure that the valid and essential data was extracted by the RG members from the wealth of data that had been collected. Not all the data could be analysed in the immediate aftermath of the conflict assessment. Some data analysis had to re-done at a later stage after it had been translated. An important lesson-learnt is that data handling and analysis at the end of the process has to be well thought through prior to undertaking the exercise. The result of the initial data analysis of the Reference Groups was then shared amongst and between the different Reference Groups. This process was important to verify information and confirm the results of the assessment. The analysed information was subsequently compiled into an initial report for further presentation. One of the objectives of the overall process was also to provide a platform at which the RG members could present and discuss the findings and recommendations of the conflict assessment with key decision makers. Therefore, the analysed data and information compiled by the RGs was presented and discussed with the consultative group. The CG members in turn could share their impressions, perceptions and recommendations on the presented findings. The CG made some additional comments and proposals to be included in the final report. The whole presentation and discussion process provided an opportunity to share reflections on the results and recommendations of the conflict assessment. A second important objective of the presentation and discussion was to gain and ensure the necessary political legitimacy of the process and attain political ownership of the results and recommendations. This was achieved through the presentation of the results by the conflict stakeholders themselves (e.g. the Reference Group members) and through the final decision and endorsement of the results by the Consultative Group. A third and longer term-objective was to gain acceptance by the reference group members to continue the process that had been initiated through the conflict assessment, meaning to search for solutions for addressing the conflicts. This is probably one of the most important aspects of the participatory approach, namely that the assessment is really only one element of a whole conflict transformation process. The reference group members and the conflict stakeholders need to continue the process of searching for and implementing measures to resolve the conflicts sustainably. After presenting the key result and gaining the endorsement of the findings and recommendations by the Consultative Group, the elaboration of the conflict assessment report was undertaken. This not only required a thorough review of the results presented but also necessitated a further review of the wealth of data and information collected. The report followed a basic agreed upon structure. The report provides a very good basis for any future conflict assessment as well as the necessary benchmarks for monitoring and evaluation purposes at a later stage. The conflict assessment as a core process was successful. As an output, it was delivered on time, following the plan and producing quality results. As a midterm result, it has initiated a dialogue process and it has engaged the participation of the key stakeholders of Caraga region and also provided a valuable approach for improving the synergies between the key stakeholders in the region. It is important that follow-up measures are undertaken not only to maintain the dynamics that the conflict assessment helped to create but also to address and eventually assist in resolving some of the conflicts. Measures could include assisting further negotiation, or mediation approaches, developing and implementing joint development activities as part of confidence building measures, and so on. Since not all the data could be analysed due to large volume of text information, it would be important to go through the data again and re-assess it to derive further indications of the conflict situation in the region. A detailed proposal on who will undertake what as far as follow-up measures is concerned was then completed. Capacity of stakeholders: Since the RGs had different levels of capacity, the three day training was not sufficient for many to have the confidence to conduct the KIIs, and more so the FGDs themselves. In some cases, TWG members had to step in and facilitate the process themselves, which was not intended. Some interviews became too long as interviewers did not feel confident to cut off discussions of issues not relevant to the conflict assessment. Documentation skills also varied and expecting the RGs to not only document but also refrain from injecting their interpretations proved difficult and required constant monitoring by the TWG. RGs had difficulties in building trust and convincing the stakeholders of the nature, the objectives and the uses of the conflict assessment, especially the “doubting and suspicious” ones. They experienced limited cooperation or hesitance by some to reveal some information for fear of reprisals. Timely submission of documentation forms was also a challenge. This could likewise be attributed to the varied capacities of the RG member in documenting. Language: Each typology team had at least one member who could not speak and understand the local vernacular. This made translating information from local vernacular to English a tedious and time-consuming process. Translating and encoding the raw data (from KII and FGD proceedings) could have been partly improved by hiring translators and encoders. If the process involves working in the local language, adequate resources need to be provided for translation. Especially for the extensive data and information collected through the focus group discussions and key informant interviews. Information handling: The wealth of information that was generated exceeded all expectations and proved hard to handle. Not least because of the fact that much of the information was in the local language and needed to be translated for further handling purposes. There is still a great deal of knowledge to be gleaned from the information that was gathered. This requires further review and analysis of the information. The use of experienced documenters is advisable for fast documentation of the collected data. Moreover, a clear agreement on tools and methods of data analysis could have provided more guidance for the actual analysis phase. A more structured form of data gathering and handling should be developed. Confidentiality had to be ensured, but this proved challenging in some areas where there was no proper venue to conduct both the KIIs and FGDs. This made it necessary to ensure that the situation in the area after the KII/FGD was monitored to ensure that no conflict discussed during the assessment then created a new conflict or activated a latent one. Need for critical reflection: Sufficient time is needed for the critical reflection processes regarding the use of the data collection tools and overall conflict assessment methodology, especially as far as data analysis and quality assurance is concerned. Critical reflection can be undertaken in form of peer-to-peer reviews. This can help to level off the skills and expertise in diverse. Once the implementation process has started to continuously observe the ongoing dynamics (rumours, security, and manipulation). Time requirements: Undertaking such a complicated conflict assessment within a three-month period of time stretched all the logistical and administrative arrangements to their limits. Although more time would have been better it would also have been difficult to sustain the momentum of the process over a longer period of time. Geography and logistics: Some areas are difficult to reach; they are either in remote or insecure areas requiring extensive security clearance. In some cases the RG and TWG had to hike to the remoter areas, this meant that less time was available for the KII and FGD. A modality has to be developed for travelling to and working in remote and insecure areas and it is important to ensure sufficient time is made available for this process. Private sector involvement: Need to include all viewpoints, including private sector. This is not always possible during the fieldwork and may have to be undertaken separately from the reference group meetings. In some cases the private sector are also not living in the conflict areas and need to be contacted in other towns in Mindanao or even in the capital Manila. This process is impossible for the Reference Group members and it is therefore necessary for the TWG members to undertake such interviews in order to ensure that the private sector is properly represented in the process. Length of commitment of stakeholders: The length of time that the RG members will be expected to participate in the process was too long for some. In some cases landowners were busy with harvesting and could not participate in the process. They were only available as key informants. Clarification of roles, functions and internal communication: Important is to clarify at the outset how the team is to be organised, how the participatory process is to be undertaken and what level of participation will be expected. Also important is to clarify roles and responsibilities and assign clear leadership roles at the start of the process. Communication mechanisms and flows amongst and between the different TWGs should be agreed upon early on and need to be practised and followed by all members. This includes informing each other during the process through short daily reports, thus allowing an exchange of information between the TWG members assigned to the different typologies. In view of the considerable strains placed on the teams, it would be advisable to put into place an internal conflict resolution mechanism. 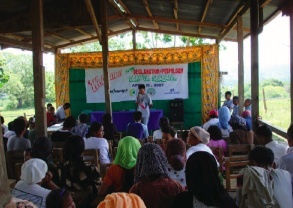 The participatory aspect of the conflict assessment already empowered the RG members. This has to be followed-up. This can be in form of capacity development, strengthening their skills in conflict transformation, mediation, negotiation and also undertaking confidence building measures (e.g. livelihoods or poverty reduction measures). The RG members should be given the possibility to connect amongst themselves (inter and intra typology connections) in order to exchange their experiences. 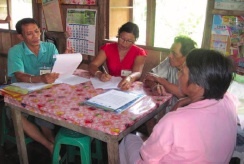 As part of the ownership aspect the results of the conflict assessment should be communicated and discussed on community level (popularization) as quickly as possible after completion of the conflict assessment This would also help to promote their cooperation in follow-up processes (e.g. through a road show presenting the results as a first follow-up measure). It is also important that the long-term effects of the conflict assessment continue to be monitored.